The Third Annual Coronado Rotary Music Scholarship Competition for high school students featured dynamic instrumental performances at a Rotary luncheon meeting. 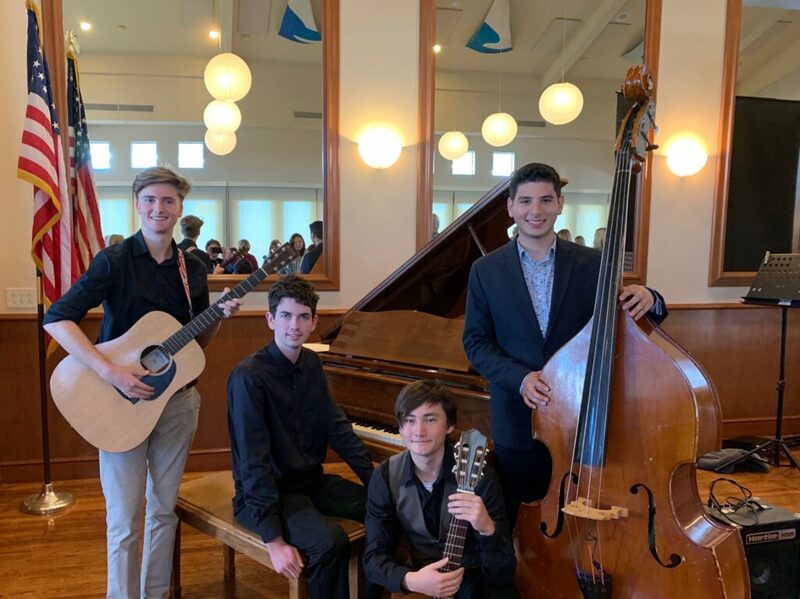 Pictured above are first place winner Ryan Wood (guitar), second place Alex Murray (piano), and finalists Sebastian Sanchez (bass) and Michael Storm (guitar). Four very talented musicians took center stage at a recent Coronado Rotary luncheon meeting after becoming the finalists among a large field of contenders. In December, Coronado High School and Coronado School of the Arts (CoSA) students in grades 9 through 12 were invited to participate in the 2019 Third Annual Coronado Rotary Music Scholarship Competition. Fifteen students entered the prelims, with instruments ranging from saxophone to piano and trumpet. Mariah Gillespie is founder of Ms. Mariah’s Music, offering in-home piano, harp, and voice lessons to students of all ages. She has been a featured soloist with the Southern Great Lakes Symphony (harp) and was twice awarded the Wayne County Council for the Arts Artist Award as well as the A. Elaine Bychinsky Award in Music. Mariah currently serves as the Arts Education and Musical Arts Commissioner for the City of Coronado.